Welcome to our Finding Nemo coloring pages! 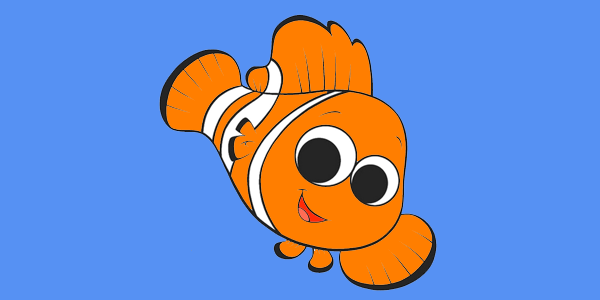 On this page you can find some very nice Finding Nemo coloring pages which you can color as you’d like, but you can also find some very interesting information about Finding Nemo. Marlin, a clownfish, has just found an anenome for himself, his wife, Coral, and their 400 eggs to live in. When a barracuda suddenly attacks and eats all but one of the eggs, and presumably Coral, Marlin becomes very protective of the only one that survived, whom he names Nemo, a name Coral liked. Nemo was apparently born with an abnormally small lucky right fin which causes Marlin to not only worry over his swimming ability but also doubt his son’s ability to do anything. On his first day of school, Nemo disobeys his father and ventures away from the reef to touch the bottom of a boat. This enrages Marlin, and starts an argument in front of Nemo’s classmates. To his father’s horror, Nemo is captured by a scuba diver. Marlin tries to save Nemo but is blinded by the camera flash of another diver. The boat disappears into the distance. In search of help, Marlin bumps into Dory, a naïve but good-hearted and optimistic Regal tang with short-term memory loss. While meeting would-be vegetarian sharks Bruce, Anchor and Chum, Marlin discovers a diver’s mask that was dropped from the boat. During a hazardous struggle with an anglerfish in the deep sea, Dory realizes she is able to read the address written on the mask,P Sherman, 42, Wallaby Way, Sydney. After receiving directions from a large school of moonfish, Marlin and Dory set out to find Sydney. They encounter hypnotic jellyfish where Marlin saves Dory’s life, nearly at the cost of his own. Later they befriend a surf cultured sea turtle named Crush, who is 150 years old and still healthy and strong, while riding the East Australian Current. In the current, Marlin reluctantly shares the details of his journey with a group of young sea turtles, and his story spreads rapidly across the ocean through word of mouth and eventually reaches Sydney. Meanwhile, Nemo’s captor, a dentist, drops him into a fish tank in his office on Sydney Harbour. There, Nemo meets its residents — a group of aquarium fish called the Tank Gang, led by a crafty and ambitious moorish idol named Gill. The fish are frightened to learn that the dentist plans to give Nemo to his niece, Darla, who has previously killed a pet fish by shaking its container. Gill gives Nemo a role in his most recent escape plan, which involves jamming the tank’s filter and forcing the dentist to remove the fish from the tank while he cleans it manually. Nemo attempts to jam the filter using a rock, however his first attempt fails and nearly kills him because of the fact that the fan is too strong for the rock to be wedged in, but he later succeeds after a friendly pelican named Nigel visits with news of Marlin’s adventure. The plan, however, is backfired when the dentist installs a new high-tech filter and has no need to take the fish out of the tank. Now that you’re done reading, you’d better move on to our Finding Nemo coloring pages quickly!